When you blog about interiors you are always wanting to try out new ideas and come up with new plans. But you soon run out of space! We would love to be able to put an extension on the back of this house. This would create a large open kitchen and dining room. Something that would be amazing and would free up the room within the current house too. As soon as I start thinking about extensions I start thinking about how I would decorate the new space! I can’t help it!! So I thought I would put together my ideas. Of course this isn’t happening yet (you guys would soon know about it!) so I have gathered some ideas together of styles I love and pieces I love. I would love to be brave and go bold. The space would be lovely and open and would deserve a statement kitchen to go with it. 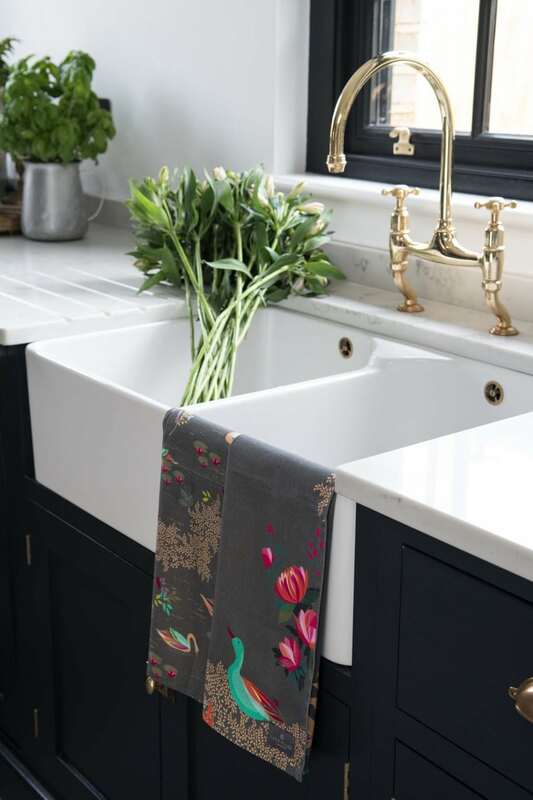 I have always been tempted by dark kitchen units, and then I need to start choosing what kitchen worktops to go with it. Could I be brave enough to go with white worktops? Then I spotted this one with gold taps too! The shot of colours look fantastic with them too. I really want a big table that everyone can sit around with no squeezing on when other people come to eat with us too. With the table in the kitchen people are able to sit down and chat to you when you are cooking. The children can sit there and do their homework without being away from you. A big table to be able to get the kids crafts out all over and come up with some fantastic creations! Although one end will get filled up with paperwork though I am sure!! This area is going to have a high footfall and that means the floor needs to be hard wearing. This will be our only access to the garden, so kids and dogs coming in and out of the door all day in the summer. Muddy dog paws in the winter too. Wood flooring is tough enough to handle this but gives a warm feeling underfoot. 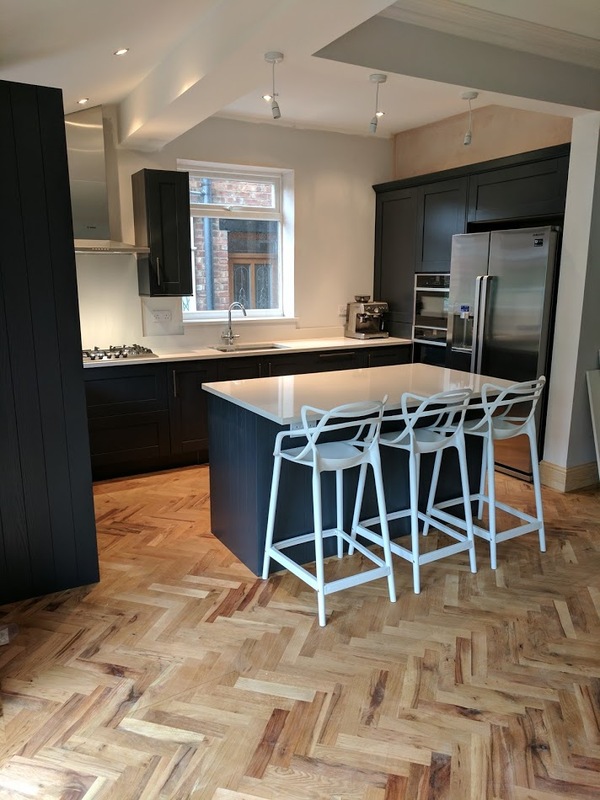 Having dark units and white worktops can be pretty harsh colouring, so by adding in a warm wood flooring then you instantly add in some warmth. I came across this stunning kitchen and it’s perfect. 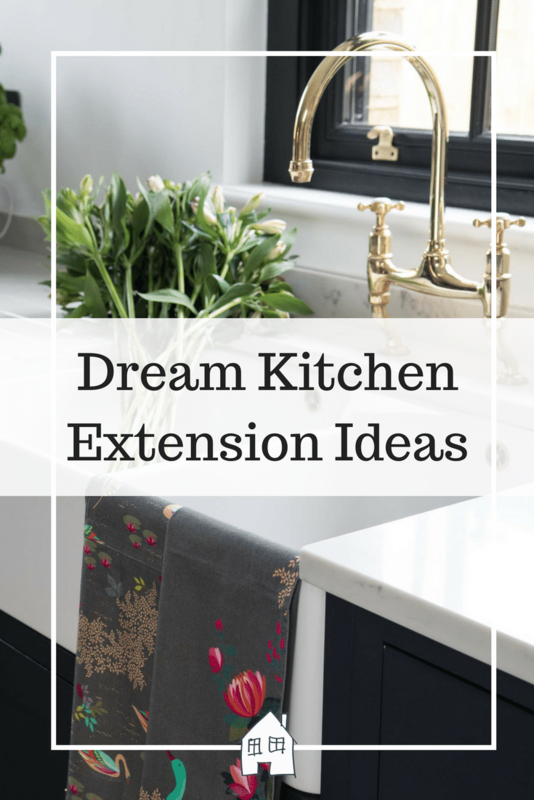 So what do you think of my dream kitchen extension ideas? What colour kitchen do you have? Thank, we can keep our fingers crossed hey! Sounds like my dream kitchen too. I hope one day I’ll have a kitchen like that. I especially want a massive family table like you’ve described and I like the idea of a sofa in there too. Wood definitely warms up a monochrome scheme. We found that with our kitchen. Oh I am glad you like the idea too! 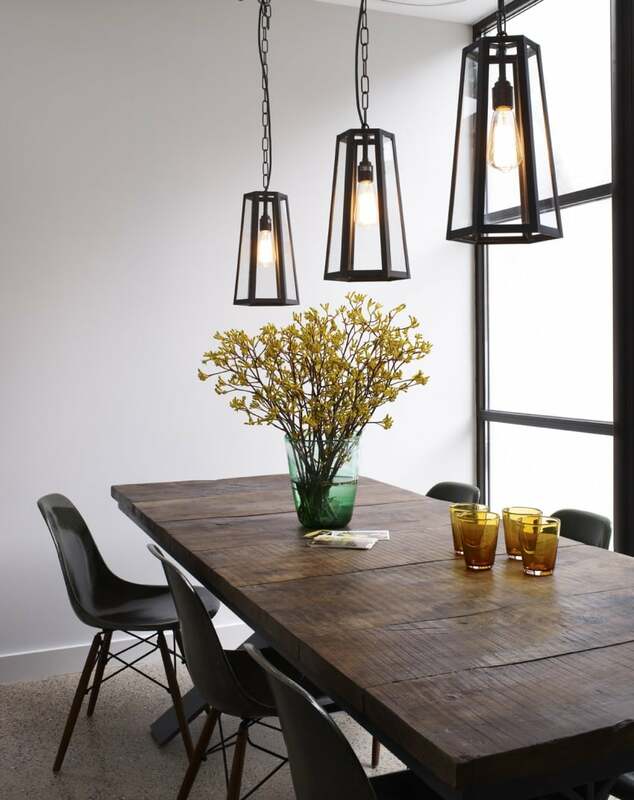 Something about a huge dining room table that makes it feel all homely doesn’t it! My dream kitchen would need lots of surface space: it seems that no matter how often I tidy I still don’t have enough room to actually cook! Interesting to read about the trends you have highlighted. I never would think of having a sofa but I know our neighbour has one in their kitchen! Yep my current one has 2 small areas and that isn’t enough at all! My kitchen is white and black. It works for us. Love the sound of hard wearing floors. Wish we had that for our ground floor. You need it with so much footfall don’t you. Ours is currently white! It’s great to have a pop of colour, adds a bit of fun doesn’t it! It sounds wonderful. I’m looking forward to when we finally get a house here in Portugal and we can get our dining table and chairs out of storage. I miss it! 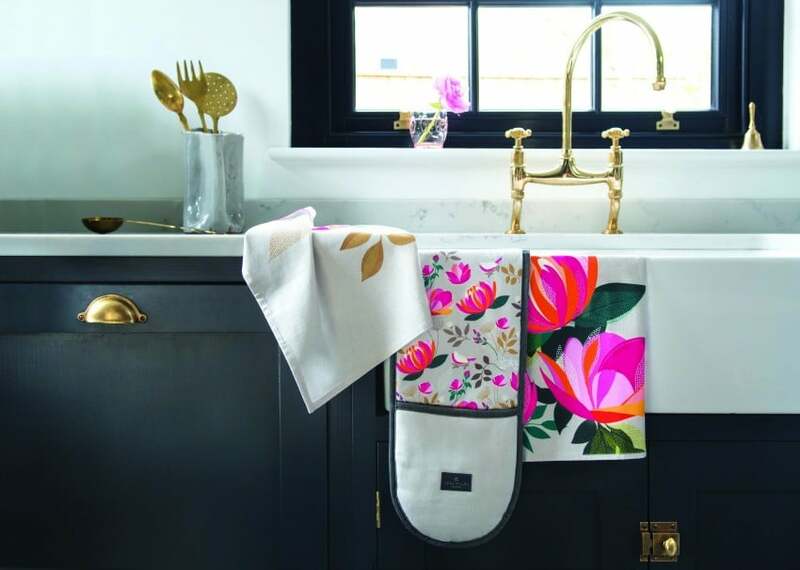 I can’t get over how pretty those tea towels are! And a sofa, placed in the morning sun sounds fab. Just need a cup of tea, some biscuits, and a good book. The ideas sound great Steph, good luck with them! This looks so lovely!! I love having our sofa upstairs in the quietest part of our house it is so nice. But then again our TV isn’t plugged in anyway!!! lol! But upstairs is a little more peaceful!! 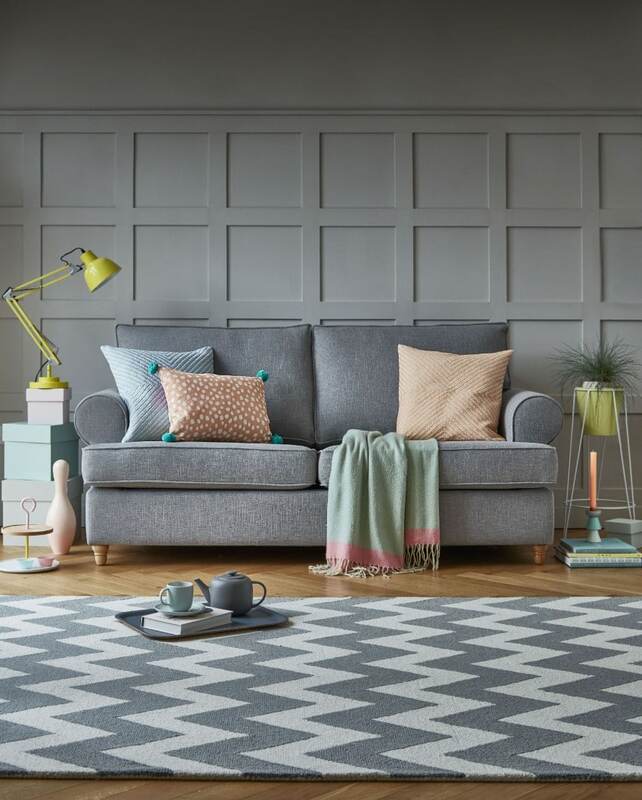 I like the idea of having a sofa in a quiet corner, away from the telly! Yes just a little bit of peace now and again!